Apple has released the first beta builds of OS X 10.11.4 (and yes, OS X 10.11.3 is still at beta 2), tvOS 9.2, WatchOS 2.2, and iOS 9.3 for users enrolled in the developer beta programs. OS X 10.11.4 beta 1 arrives as build 15E27e and is likely a compatibility update for users running the other beta releases, as a new version of Xcode coincides with the release as well. There are no known feature inclusions with OS X 10.11.4, so it will likely focus on compatibility and bug fixes. WatchOS 2.2 beta 1 appears to be primarily focused on bug fixes and compatibility as well, and includes support for paired iPhones to pair with multiple Apple Watch devices. tvOS 9.2 beta 1 includes support for Bluetooth keyboards, which has been a much desired feature, and also includes support for folders. 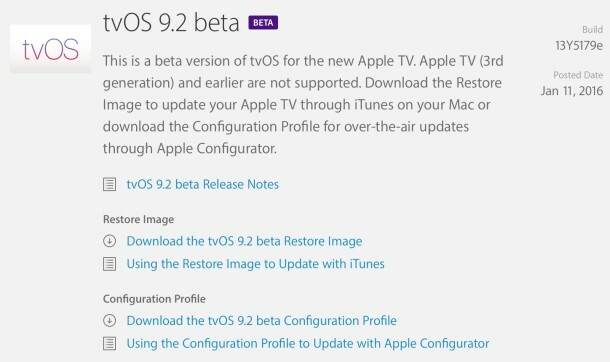 Several other feature enhancements and refinements are bundled with the beta release for 4th generation Apple TV hardware. Finally, iOS 9.3 beta 1 looks to be a fairly notable point release, with some notable new features including Night Shift mode for device usage in the evening hours, password protection for Notes app, and multi-user account support for educational devices. You can read more about iOS 9.3 beta 1 here, which is available for beta testing on compatible iPhone, iPad, and iPod touch.